We are very pleased to introduce to you our new Bulldogs Football Head Coach, Mr. Jason Lafferty. Jason comes to us with a very broad and high level of coaching as well as a Master’s Education degree. Bellerose Composite High School, St. Albert Public Schools and Bulldogs Football are very fortunate to have Jason onboard as our new Head Coach. Jason will be joining us for Spring Camp in two weeks and he is looking forward to meeting all of you and to start our 2018 season. Watch this inspiring video from the Bikeathon 15 students at Bellerose Composite High School. These kids have raised an incredible amount of money to fight cancer over the past 15 years and this year is no exception. Bulldogs Football players inspirational leader was Coach O whom we lost to Cancer just recently. He would be proud of all of you, I can hear his voice "WOW, isn't that something?" It is with great sadness that we announce that our beloved Coach O, Larry Olexiuk has passed away just before the new year. I know a lot of you may have already been told through social media but I was waiting for details of a 'celebration of life' to become more clear before we posted this on our website. Larry was a huge part of this football organization from it's inception through to our very last event of 2017 which was our awards banquet that he attended and spoke at. 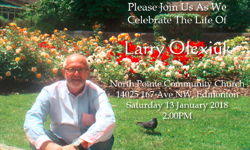 Larry's courage and depth of character will always be a part of Bulldogs Football and we will be proud to play at Larry Olexiuk Field for years to come.